Anglers eagerly await the damsel hatch because it can provide some of the most exciting fishing of the year. Fish find the swimming nymphs to be an easy meal and the visual take is often similar to that with a dry fly. This is a time you do not want to be without the right fly and the Tan No Name Damsel is one of the most effective damselfly nymph patterns available. The simple design along with realistic mono eyes match the shape and swimming action of a natural nymph perfectly. Anglers are often unaware of how productive a tan colored damsel can be. There will often be different colored nymphs living in the same water and the fish will sometimes key in on only one. On many waters Callibaetis Mayflies will hatch at the same time as Damselflies. A lighter colored pattern like this can imitate both insects and can give you even more success. The Dark JRS was originally created by Western fly fishing guide, Jake Ricks, to imitate a local clinger-type mayfly nymph. This now proven pattern combines properties of several proven fish catching nymphs into one super nymph. This exclusive RiverBum nymph pattern has proven to be the ultimate all around nymph in many fly boxes around the world. 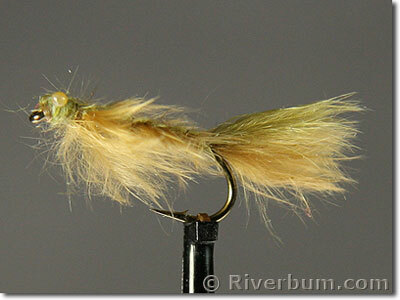 This fly effectively matches several varieties of mayflies and stoneflies and simply looks tasty to hungry trout. If you don't know what to try this is a great searching or prospecting nymph fly that seems to trigger strikes in all kinds of water.